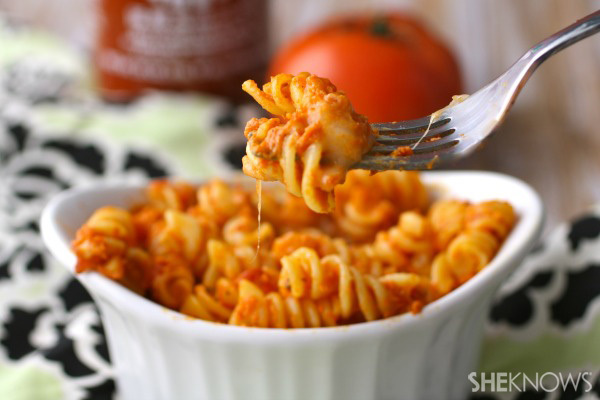 You might not normally reach for Sriracha when you’re making pasta, but this recipe includes the spicy sauce to heat things up for Sunday dinner! 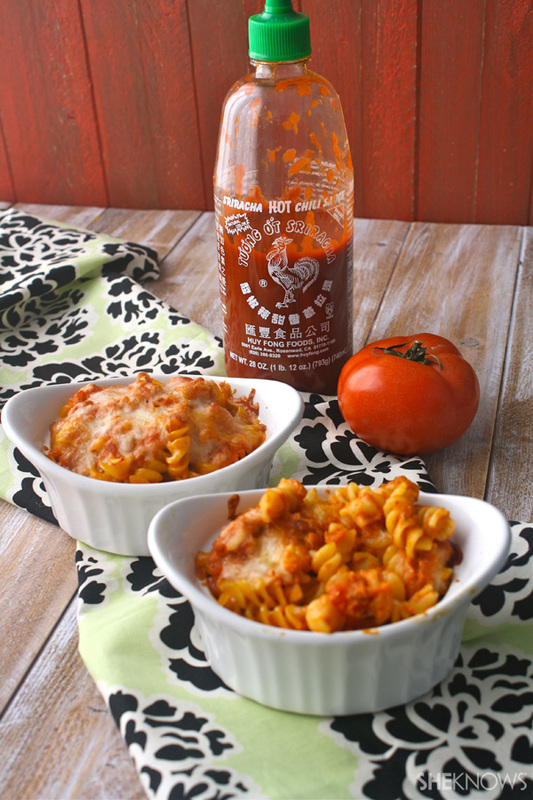 It’s time to spice things up for Sunday dinner with this recipe for baked pasta with Sriracha cream sauce. When it comes to the spicy “rooster sauce,” better known as Sriracha, you typically either love it or you don’t. I love it and like to find different ways to incorporate it into mealtime. If your family can handle the heat, they’ll love this dish! You might not normally think to add Sriracha to pasta sauce, but it makes sense (think spicy arrabiatta sauce) and adds excitement to traditional tomato sauce. I included half-and-half in this recipe for added creaminess, and it might help to keep things a little less fiery! If this is the first time you’ve used Sriracha, consider using a bit less than what the recipe calls for until you’re familiar with its flavor. Add the olive oil to a deep skillet over medium heat. When hot, add the onion, salt and black pepper. Cook for 4-5 minutes, or until the onion is translucent. Add the garlic and cook for a minute or so, taking care not to burn it. Add the diced tomatoes, tomato sauce, Sriracha and oregano to the skillet. Simmer the mixture, stirring occasionally, for about 15 minutes. Turn off the heat and add the half-and-half. Mix well. About halfway through simmering the sauce, preheat your oven to 375 degrees F. Lightly spray 5 (6 ounce) baking ramekins with the nonstick cooking spray and set aside. Add enough water to a pot to cover the pasta, along with 1 teaspoon of salt. Bring the water to a boil and add the pasta. Cook according to the package directions. Drain the pasta and put it back into the pot. Add all but about 2/3 cup of the sauce to the pasta, along with the Parmesan cheese, and mix well. Spoon the mixture into each of the baking ramekins, just to the top. Evenly divide the remaining sauce between each and pour it over the top of the pasta. Evenly divide the mozzarella cheese and sprinkle it on top of the pasta. Place the ramekins on a baking sheet and bake for 15-20 minutes, or until the cheese is golden and bubbly. Remove from the oven and allow to cool for several minutes before serving. The pasta may still be hot, so use caution when eating. 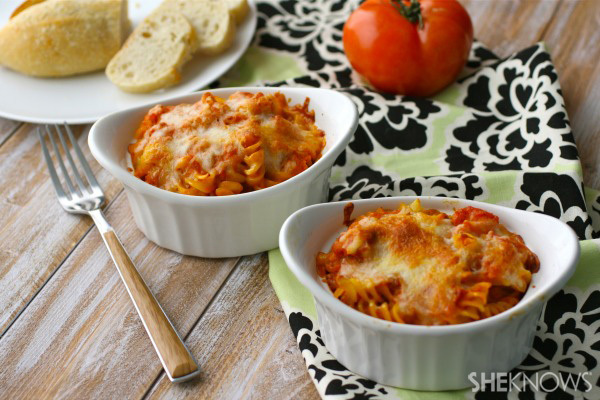 Spice up your Sunday pasta dinner!